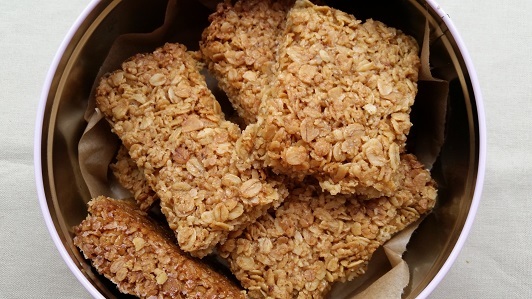 The flapjacks of my childhood were chewy flapjacks (the kind you can feel destroying your teeth as you eat them) so for most of my life I’ve been a chewy flapjack girl, not really understanding the appeal of thicker, softer flapjacks. In my head they were just flapjacks that had gone wrong. Then I ate one the other day and I’ve discovered the joy of soft flapjacks 🙂 I had this particular flapjack in the cafe at Yorkshire Scuplture Park which is a place I can highly recommend, both the park and the cafe, if you happen to be on the M1 just north of Sheffield. The flapjack was beautiful. Soft, sweet, buttery and satisfying. Since I saw the light I’ve been hankering after another one so yesterday morning I decided to try and make some (in no way discouraged by my partner!). I had a look through my most likely recipe books and settled on an adaptation of Nana Goy’s Cranberry Flapjacks from the “Leon Baking & Puddings” book by Claire Ptak and Henry Dimbleby. They described them as “moist and deliciously oaty like a good flapjack should be” which sounded like just what I was after. I skipped the cranberries because I’m not a fan of dried fruit plus I wanted a plain flapjack. I increased the quantities of the other ingredients slightly but I did keep to their proportions. And they were very successful. Too successful really. 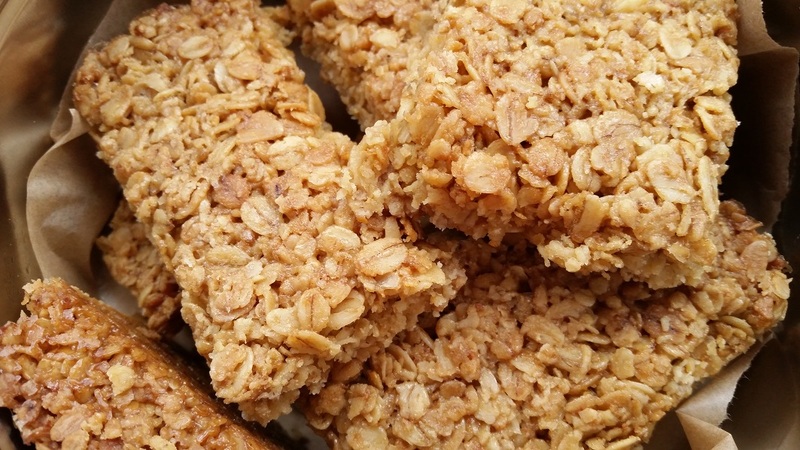 They’re very moreish and definitely not the ones for you if you’re looking for a healthy flapjack! There’s a scary amount of butter in them. They are also incredibly quick and easy to make. They only take 10 minutes to put together and smell lovely as you’re making them. I used the larger “old-fashioned” oats because that’s what we have in for making porridge but I think the normal ones would be better, a bit smoother. I would definitely caution you against lining the tray with paper when you make flapjacks: Just grease it with butter. 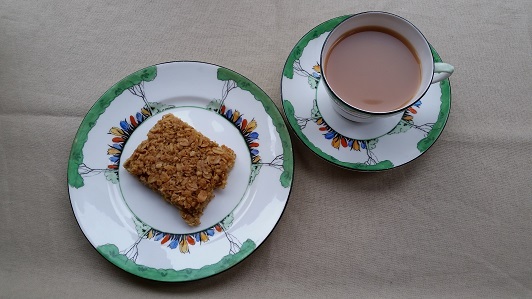 I once used greaseproof paper when I was making flapjacks and spent lots of time picking it off the flapjack/out of my mouth which took a lot of the pleasure out of eating them! Heat the oven to 170°C/gas mark 3½. Grease a baking tray (approximately 26cm x 16cm) with butter. Put the butter, syrup and sugar in a saucepan and heat gently; stirring to melt and combine the ingredients. Add the rolled oats and mix together well. Empty the mixture into the tray and flatten out with the back of a spoon. Bake for 25-30 minutes until golden brown. (It will still be soft to the touch; they firm up as they cool down.) Err on the side of under-cooked if you aren't sure otherwise they go crunchy! Let the flapjacks cool for 5 minutes and then mark into pieces (I made 12 but mine are quite large!). I’ve printed this recipe out to try later. where I live, flapjacks are what we call pancakes! funny how the English language is so varied from place to place. That’s interesting – where do you live? I was thinking about this thing with words already because what I call ‘golden syrup’ in this recipe, my partner calls treacle – and we’re just from opposite sides of the Pennines in England.